It's Friday! And, the last day of June - how can that be? 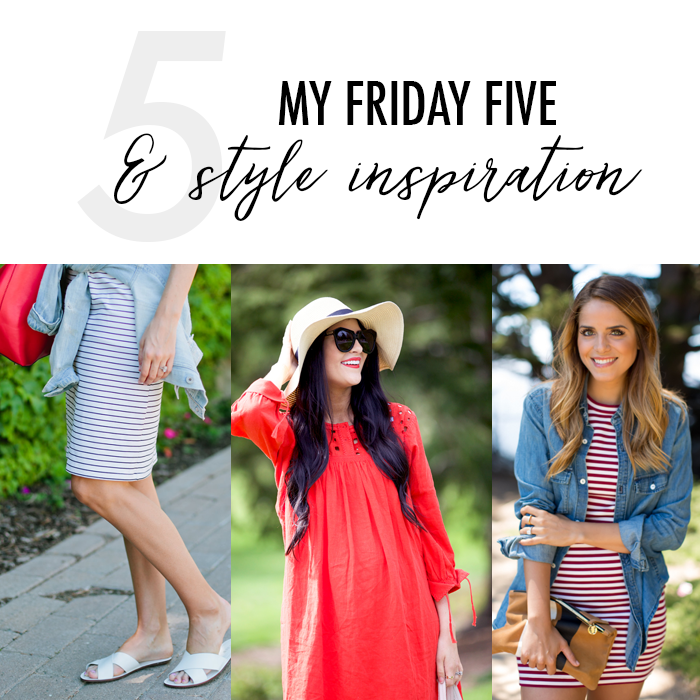 I'm sharing my Friday Five, along with five more things about me. Also, a little 4th of July style inspiration above. Velvet is going to be a big trend - and these flats are only $18. This cute summer skirt that is 50% off. This cold shoulder sweater that is only $12 on sale. This adorable lemon print top that is only $15. This fun floral dress that is under $25. These cardigans that come in four colors are only $19 - and it's two for the price of one! These lace up sandals are under $25 - on sale! I love my camo jeans - and these are on sale for $35. These leopard slides are $35. My friends on TBB are doing a Q + A on Monday - and since I don't typically post that day - I thought I would answer five of the questions today - and use it as an opportunity to promote the post. So, be sure to stop by TBB on Monday. And, if you want to join in the fun on Monday - you can find the questions to answer here. 1. Favorite animal - dog or cat? Cat. I had a couple of cats growing up - but the one that is probably the most special to me was the one I picked out from the Humane Society when I was in the third grade. My dad took me to pick out a cat - and instead of picking the beautiful long haired one - I picked the sad looking one with a scratch on his head. I think I thought he needed a home. My cat and I had similar personalities - he liked to be around people - and could tell when someone needed a friend (or had had a bad day) but he also liked his "me" time. He lived a good, long life - and I had to put him to sleep the first year I was married. It was one of the most difficult things to do. 2. Chick Flick, Action Movie or Documentary? Chick Flick. Some of my favorites are Becoming Jane, Young Victoria, along with your cheesy Christmas movies - like this one, which is one of my top picks. Is anyone else excited that Hallmark is running Christmas in July starting the same time as the Nordstrom Anniversary sale. Here's the schedule. I also like climbing documentaries. I don't know why - because I do not think I would ever want to go climbing - but for some reason I love watching those beyond extreme conditions - and survival stories - like this one. It was so difficult to watch - because of the extreme torment the guy went through. I really do not care which one as long as it is diet. I prefer Coke most places, but sometimes Pepsi fountain pop tastes really good. McDonald's Diet Coke is one of my favorites (along with their fries). Question - do you call it pop, soda, or something else? When I was at Parsons - I had a good friend from Chile - and it always made her laugh when I said I needed "a pop". She didn't know what I was talking about. 4. Music or Talk Radio? Oh, definitely Music. I am a channel surfer - from my Sirius Channel 43 Backspin to Chanel 07 - the 70s station. I have a very eclectic music taste. On the other hand, my husband loves talk radio - and interviews. I can tolerate it for a little bit - and it does help pass the time on a long drive - but news hour on NPR goes on too long for me. I would rather be listening to music. 5. Swimming or Laying Out? Laying out. I will soak my feet - but I really do not like to swim. When I was younger I would swim more, but I really do not like to be under the water. The fact I nearly drowned when I was very young - impacts my enjoyment of swimming, I think. Luckily, my dad saw me bobbing in the water - jumped our pool fence to save me. It just took a matter of seconds for me to get away from my parents and jump in the pool because I thought I could swim - but I couldn't. When I was younger I was so afraid of the water - I had to take private lessons because I was too scared to put my head under water. Also, my friends at The Blended Blog are hosting a Fashion link up. Photo Credits: Left / Middle / Right // I am participating in the following link-ups. Love your festive outfits for this weekend! Yes to all the Hallmark movies. I wish we had cable so I could watch all of them. and the Christmas Kiss, watched on repeat this year, when I found it on Netflix :) The second Christmas kiss is cute too, but the first one can't be beat. I like the Sprite at the movie theaters...so bubbly and good. I like music over talk radio for sure but now I'm getting into podcasts. Does that count as talk radio?? In the south we say Coke for everything. "Do you want a coke?" "Sure!" "What kind?" "Root beer..." Sometimes to be silly I call it a carbonated beverage. But then my husband's answer is beer. What a fun read, well except for the part where you almost drowned when you were young - every parent's nightmare! Thank you for sharing your favorites and for linking up with Fabulous Friday. Best Deals + Cute Bathing Suits for Under $20!